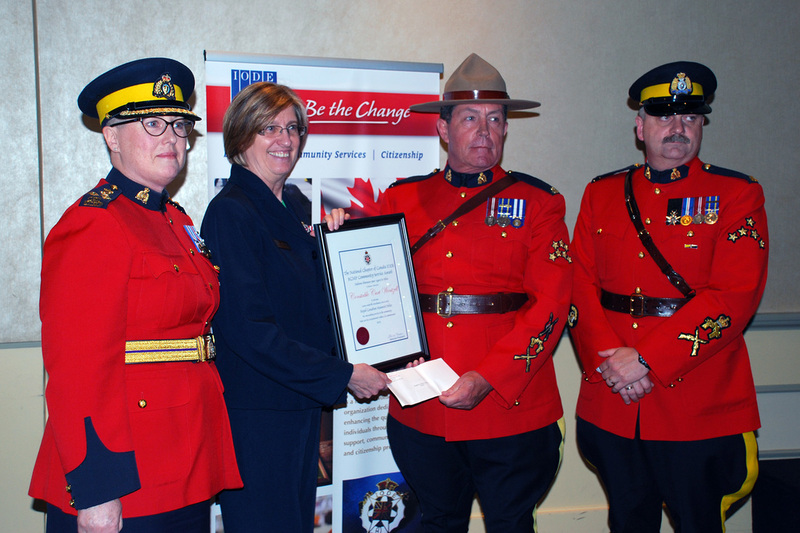 IODE Canada, on behalf of its members, established an award to recognize a member, unit or detachment of the RCMP for exemplary public service to their community outside of their official duties. Each year, the office of the Commissioner of the Royal Canadian Mounted Police chooses the recipient. 2015 is the 22nd Anniversary of this award. Constable Curt Wentzell, H Division, Lower Sackville, Nova Scotia, has won the prestigious IODE RCMP Community Service Award, established in 1993, presented to an individual or detachment that demonstrates tireless, exemplary off-duty volunteerism. Constable Wentzell is well supported by his active participation in numerous volunteer programs in and around Dartmouth, Nova Scotia, over many years. Since 2013, Constable Wentzell has been the Community Awareness Chair of the Cobequid Radio Society and is on the Board of Directors for the Sackville Heights Community Centre, including but not limited to Early Intervention for Children with Challenges, the Boys and Girls Club and Silver and Gold Seniors. Constable Wentzell is responsible for staffing, governance, structure maintenance, fundraising and mediations. He is also a member of the Sackville Lions Club, becoming the King Lion in July 2014. Through the Lions Club, Constable Wentzell has volunteered for the Relay for Life, serving on the Board of Directors in 2008, to raise money for cancer research and was instrumental in creating an RCMP team. In 2006, he joined the Second Lake Park Association. Constable Wentzell joined the Sackville Rivers Association in 2005 and has participated, since then, in such activities as waterway clean-ups, fish stocking, awareness booths, etc. Constable Wentzell was a Beaver leader for Scouts Canada, later becoming the Group Committee Chair for 60 Youth. At Constable Wentzell’s behest and in honour of him and “H” Division of Lower Sackville, Nova Scotia, IODE will make a financial donation of $1,000 to him for Camp Brigadoon, a specialized summer camp for children with chronic medical conditions. Constable Wentzell is involved with fundraising efforts for the camp through his participation in the Lions Clubs of Nova Scotia. Assistant Commissioner Tracy Hardy, Staff Sergeant Major Doug Pack and IODE Canada National President E. Anne Mason presented the award to Constable Curt Wentzell on Friday afternoon, 29 May 2015, during the IODE National Annual business meeting held in St. John’s, NL. 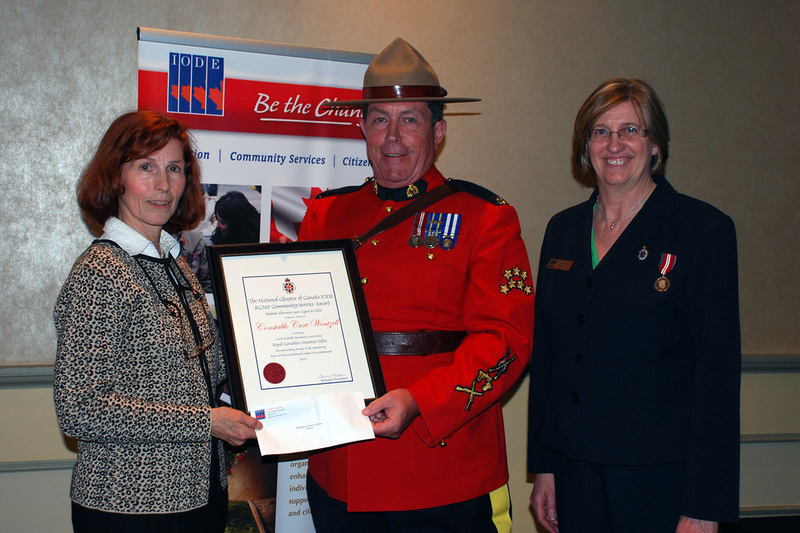 National Citizenship Officer Janet Patterson and IODE President E. Anne Mason present the award to Constable Curt Wentzel, H Division, Lower Sackville, Nova Scotia. Assistant Commissioner Tracy Hardy and Staff Sergeant Major Doug Pack attended the ceremony and joined IODE Canada National President E. Anne Mason in congratulating Constable Wentzell. "This extraordinary dedication to numerous volunteer activities, combined with over 40 years of exemplary police service, is precisely why Cst. Wentzell is so deserving of the IODE RCMP Police Community Service Award"